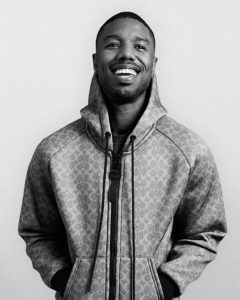 Following the success of Coach’s partnership with Selena Gomez, the company announced that Michael B. Jordan will be the face of menswear. The “Black Panther” actor, 31, will not only represent the brand but also design his own capsule collection in the future. He will meet with creative director Stuart Vevers next month to begin brainstorming ideas for his own designs. In the meantime, Jordan appears in advertising campaigns for the brand’s men’s ready-to-wear, accessories and fragrance beginning with the spring 2019 season. “I liked what Stuart was doing so we decided to move forward with me being the face of the brand,” he told WWD. When asked about his personal style, Jordan said he feels equally comfortable in a “very pristine” suit as he does in streetwear, but ultimately spends more time thinking about roles he plays. “As an actor, I’m always putting on somebody else’s shoes and becoming someone else,” he said. In fact, Jordan said that he keeps his stylist busy because he’s constantly gaining muscle mass then slimming down for roles in “Creed,” where he plays a boxer alongside Sylvester Stallone’s Rocky, and upcoming project “Just Mercy,” in which Jordan will play a lawyer.